CryptoHorse is the first Blockchain based Horse Breeding Game. which are created on Ethereum Blockchain. is different which shall be stored on the Blockchain. They have 9 different colors and 35 different attributes. With this dApp, you can exchange and breed CryptoHorses. He is Australia's leading Smart Contract Developer. He has been working in block code coding since 2012. In his numerous lectures, he shows his expertise. As an enthusiastic horse racing fan, he gives everything for CryptoHorse and the idea behind it. the former elite soldier and expert in marketing and partnerships has already worked for Queen Elisabeth II. In his spare time, he is an enthusiastic blacksmith and convinces us every time on the new with the passion and his know how he has for horse races. James is our man for cooperation and partnerships with his numerous contacts to the horse industry. Thanks to his many years of experience and his unbridled thirst for knowledge in this area, he is almost considered a hero in this area. Marco is a marketing and strategy talent that the world has never experienced. With his highly effective way of working and his irrepressible desire to drive CryptoHorse into an internationally operating company, he is already considered a strategy talent of the coming decade. He knows CryptoHorse like no other and if you would wake him in the middle of the night - he would immediately know the right strategy. Anna is a whiz kid - a true moon rocket. Her desire for absolute perfection in product development is her great strength. Her eye for graphic details inspires our team. As a self-taught person, she lives the thirst for knowledge. She has an eye for the big picture and loves everything about development. Her intelligence includes at least 2 nerds. Markus is considered a creative genius. He has already composed 4 symphonies for orchestra. As a strategist, philosopher and planner, he is considered one of the great thinkers. His tough will and urge to make CryptoHorse successful surprises us all. His passion for perfection motivates and drives us. He is a cool strategist with warm hearts. His hunger for knowledge and self-education cannot be stopped. To enumerate his expertise here would blow up the screen. His ability to bring people to peak performance is considered legendary. to participate in our team, then we look forward to your contact. What is so special about CryptoHorse? of consensus-driven by the motivation to create a worthy product. Horses have been traded for millennia. We have created a revenue-based model that anyone can participate in. user-friendly experience for a larger audience. What game modes and features can I expect in the future? including Horse city ecosystem, leagues, and tournaments. What do I need for the game? A computer, mobile or tablet with internet and a digital wallet. Yes you can! You can buy with any Browser Wallet App. Can I log in from multiple computers? you have your digital wallet installed. We recommend sticking with Chrome, Firefox, Edge or Safari. so you may want to steer clear. How do I get a digital wallet? You’ll need to put money in your wallet to make your first purchase. We can show you how to do that, too. and make sure you don’t forget your password or seed words. and items is in the secure wallet MetaMask. We recommend using this to have the best gaming experience. securely and directly on your web browser. or create a new wallet and send Ether there. What are seed words? Why are they important? Some wallets use seed words instead of a password. They let you restore your account in the case it’s deleted. your seed words can access your account and steal your assets. Please be sure to save your seed words, and do not share them with others. Can CryptoHorse change my digital wallet’s password? CryptoHorse does not in any way control. it also means we can never forcibly remove assets from your wallet. not our databases, and your wallet belongs to you. What is a “wallet address”? is a unique identifier for your wallet. and it’s used to direct assets to your wallet. I can’t access my wallet. Can you recover my horses? If you lose access to your wallet, we can’t recover your horses. so that the developers can’t edit, access, or reassign them. and anyone else who would steal them. Unfortunately, it also means we can’t simply ‘recover’ a CryptoHorse. What’s Ethereum (ETH)? Why do I need it? which CryptoHorse is built on. Where is the community channel/forum? Our Discord group is the official gathering place for our community. give suggestions and do many other cool things. You can also simply reach out to anyone in our team to seek help. I want to contribute to the success of the game. What should I do? Let us know what you would like to help. to make our community bigger and better. Do you want to be an employee in our team? (shortly on one site) to the e-mail jobs (at) cryptohorse. ch . Become a part of our team-family. Where do I find out about game updates? We discuss all the happenings in our Discord group. if you want to be informed by mail for new features. Is there a way to gain free horses? Follow us there for access to contests, and giveaways. How do I contact the CryptoHorse team? or transaction hashes so we can support you as quickly as possible. which shall be stored in the Blockchain. Is it a mare (female) or stallion (male)? it can either be a male ‘Stallion’ or a female ‘Mare’ but not both. A General horse have no gender, and can not give birth. 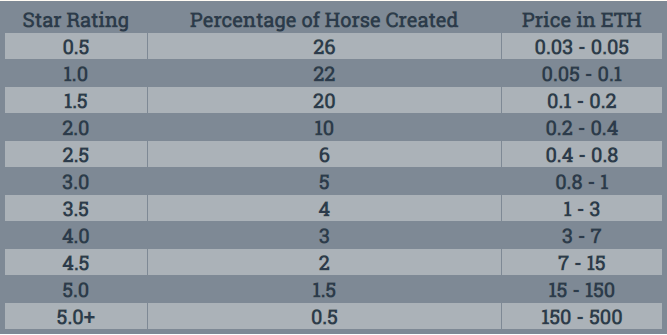 How many horses do CryptoHorse have? and stored on Ethereum Blockchain. the initial 20.000 Gen-0 horses are sold. How many CryptoHorses do I need to get started? so that you can breed them together. and has a price depending on its color and attribute. Some attributes are rare and some are common. Rarer the attributes, higher is the price. What about the quality levels and their characteristic? 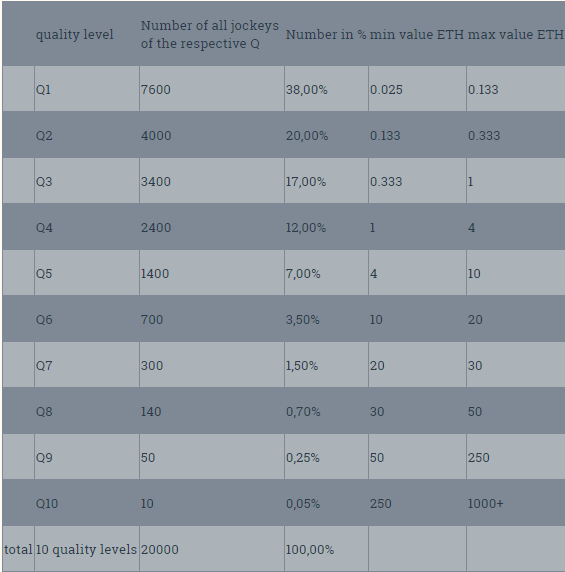 The rarer the horses on the Blockchain the higher are the prices. while competing in the horse races. Everyone can offer horses and put them up for sale. Each horse has its own characteristics. Besides, there are some fancy horses as well. Some of these have dots, wings, unicorns or zebra type. and have very high collector value. However, they do not have any special speed. one Stallion and one Mare are required by each user. and shall require another horse of opposite gender before breeding. from its parents shall be available in your Ethereum wallet. the approval of a transaction from Ethereum shall take place. Mares are born often and Stallions are rare. than the chances of breeding a mare is higher. of horses shall be created which can be traded on the Blockchain. Is there a limit of horse breeding? the number of times a horse can breed is limited to 4.
which the horse shall not be available for mating. - After fourth mating, the horse cannot mate further. for participating in horse races. What about the quality of breeding horses? Breeding high-quality horses shall bear a high-quality offspring. if the parents have the requisite genetic material. Is there a breeding fee? and can be changed several times during a day. This measure is to control inflation or deflation of the market. What about buying or selling horses? by going to the Stable. by paying the specified price to the seller. Is there a fee for the sale of a horse? of the seller goes to the CryptoHorse team. Why does the born child look similar to the parents? The parents' DNA is being inherited. My horse is not shown? Go to the stable and check if you are in the Mainnet. Can I use my CryptoHorse in other blockchain games? Yes, you can use it at CryptoRome. with CryptoRome, another blockchain game. and called them War Horses in CryptoRome. There will only be 50 battle horse ever created. them over in CryptoHorse and can use them in battle in CryptoRome. It’s the same token that you can use in both games! the two blockchain-based games, the War Horse. Why do I need a jockey? In some races, a Jockey is necessary to take part. You should assign a jockey to your horse in the race. He gives the horse a bonus when riding. What attributes does a jockey have? How is a jockey rated? of the jockey the higher is the quality of the jockey. Where do I buy or sell a jockey? You can buy and sell a jockey in the jockey club. Is it possible to breed jockeys? No, you can not breed jockeys. How many jockeys are in the game? There are a limited number of 20.000 jockeys. Why do I need a saddle? A good saddle means passion and perfection to the highest degree. A craftsmanship that finds its completion in our saddles. Not every saddle maker is suitable for your racehorse. Pay attention to the right tool and the perfect leather. 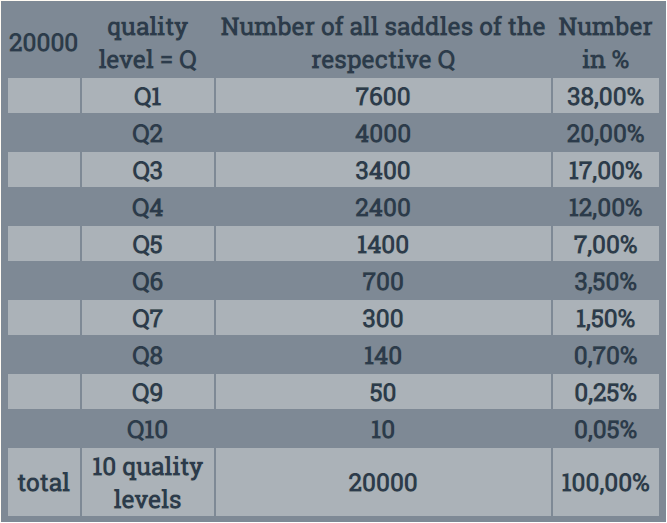 How are the saddles rated? the higher the saddle quality. Who is the owner of a saddle market? Each store has a different quality that it offers. and will be first auctioned in a Dutch auction. What does it take to own a store? What are the benefits of this? In the much kinds of races, a saddle is necessary. it automatically will appear in the shop of its quality. of every sold saddle which is in his shop. there is a sell fee of 5% wich goes to CryptoHorse. Why should I buy a horseshoe? Every horse needs a good shoe. the closer the horse gets to its full speed. Who is the owner of a horseshoe market? or change the price at any time. Imagine horseshoes are needed for some races. commission for every horseshoe sold in your shop? What Horseshoe quality levels are in the game? forge tool the higher is the quality of the horseshoe. But watch out the horseshoe can wear out and broke down.